Conventionally, grooms don’t spend too much time on their wedding outfits. But that needs to change. There are some beautiful wedding outfits for grooms and groomsmen that go beyond the plain, boring options. 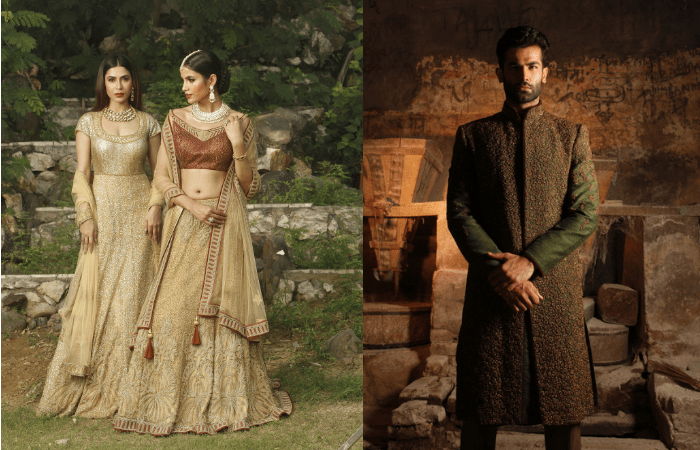 We picked out some exquisite wedding outfits from several brands across India. These outfits are perfect for those who don’t like heavy, traditional Indian looks and want to be more casual. Instead of the traditional sherwanis and bandhgalas, choose from one of these and make a mark at the next wedding. These outfits are perfect for those who love a simple, classic look. While the look is mostly Indian, the cut of such an outfit gives it a unique, western look. Pair it with brown shoes or slightly embellished juttis to complete the ensemble. While some colours are perfect for a winter wedding, there are others which are more suited to a summer or spring wedding. For a winter wedding, choose dark colours on thick fabric like velvet or silk. For the summer, choose light colours, paired with white or beige. You can even opt for slight embellishments on a summer wedding outfit to give it an edge. Bright colours and intricate embroidery look great on wedding outfits for grooms. Even when you’re attending weddings, these outfits look great and not over the top. Don’t shy away from embroidered outfits. Instead pair them with plain pants and simple shoes, so that the focus is on one part of your outfit only. The straight cuts here give these outfits a refreshing western silhouette. Floral prints on light colours are perfect for the spring wedding season. Ideal for a day wedding, these outfits combine ethnic prints with western cuts perfectly. Pair them with white or beige pants and watch heads turn at the next wedding. Apart from the traditional functions, grooms also need stellar outfits for other occasions. Leave your standard black suit aside and try something different for the cocktail. You can play around with colours in formal suits too and come up with a stunning outfit. Pair a suit like the ones below with accessories like quirky cuff links or a vintage pocket watch. While an Indo-western outfit looks great, some occasions demand that grooms and their groomsmen be dressed in traditional attire. And there’s nothing that looks more ethnic and traditional than a kurta and dhoti. With a contemporary twist, and a touch of modern fashion, a kurta and dhoti combination can really set you apart from the crowd. With the dramatic layers of such an outfit, you won’t need any accessories to make it look complete. A bandhgala is one of the safest options in wedding wear for men in India. However, this traditional jacket has also been given a contemporary revival. Try a bandhgala with pleats as a refreshing change to your wedding wardrobe. For grooms, this look is perfect for the cocktail or the reception. If you’re a wedding guest, a pleated bandhagala will look great on the wedding day too. Keep every other element in your outfit muted so that this unique silhouette stands out.